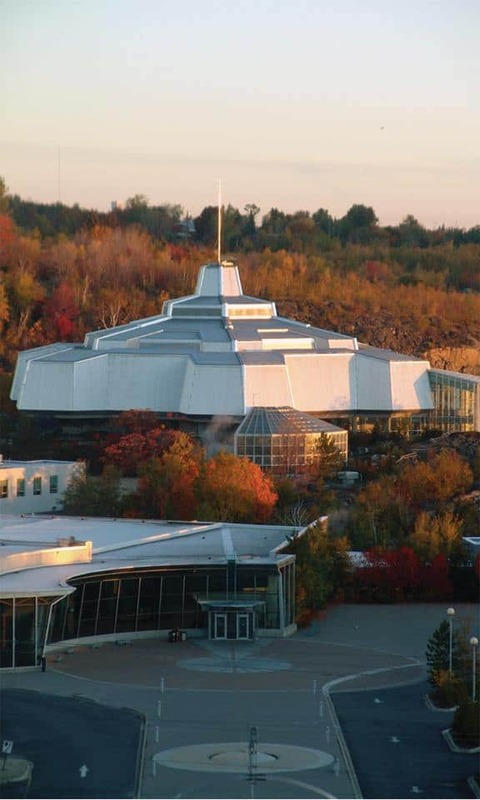 Science North is an interactive science museum in Greater Sudbury. The complex, which is Northern Ontario's most popular tourist attraction, consists of two snowflake-shaped buildings on the southwestern shore of Ramsey Lake, just south of the city's downtown core, and a former ice hockey arena which includes the complex's entrance and an IMAX theatre. The snowflake buildings are connected by a rock tunnel, which passes through a billion-year-old geologic fault. This fault line was not known to be under the complex during the construction of the building in the early 1980s. Where the walkway reaches the larger snowflake, the Inco Cavern auditorium is frequently used for temporary exhibits, press conferences, and other gala events by Science North and the wider community. Inside the main building, a 20-metre fin whale skeleton recovered from Anticosti Island hangs from the ceiling. The complex also features a boat tour, the Cortina, which offers touring cruises of the scenic Ramsey Lake. The Jim Gordon Boardwalk also extends from the facility to the city's Bell Park along the western shore of the lake. The facility was designed by architect Raymond Moriyama, one of the founding partners of Moriyama & Teshima Architects, based in Toronto. IMAX 3D - Science North has a 3D IMAX theatre. The theatre opened in 1994, and was converted to 3D in February 2009. Planetarium - In June 2009 Science North added a planetarium. It has an 8-metre dome and 36 seats. Vale Cavern - Wings over the North: a 4D Bush Plane Adventure soars through the Arctic archipelago. Lapidary Lab - Visitors learn how to cut, grind and polish rocks to turn them from ordinary stones into works of art. F. Jean MacLeod Butterfly Gallery - This glass-enclosed gallery is home to more than 400 butterflies from 30 different tropical species. Northern Forests - This area focuses on animals who live in northern forests. Some of the animals ambassadors for the Northern Forest include the Northern Screech Owls, the porcupine and the skunk. Other notable animals include the Northern Flying Squirrels, the Grey Rat Snake and the Big Brown bats. One of the biggest improvements to the third floor include a nocturnal room, allowing people to see active nocturnal animals during the day and better equipment habitats for the animals and for visitors. Also, there is an intricate bee hive, behind a plate glass window, which allows visitors to see into the hive. A tunnel extends out of a window so the bees can go outside, and re-enter the hive freely. Rivers and Lakes - In this area, animals that live in rivers and lakes are featured. 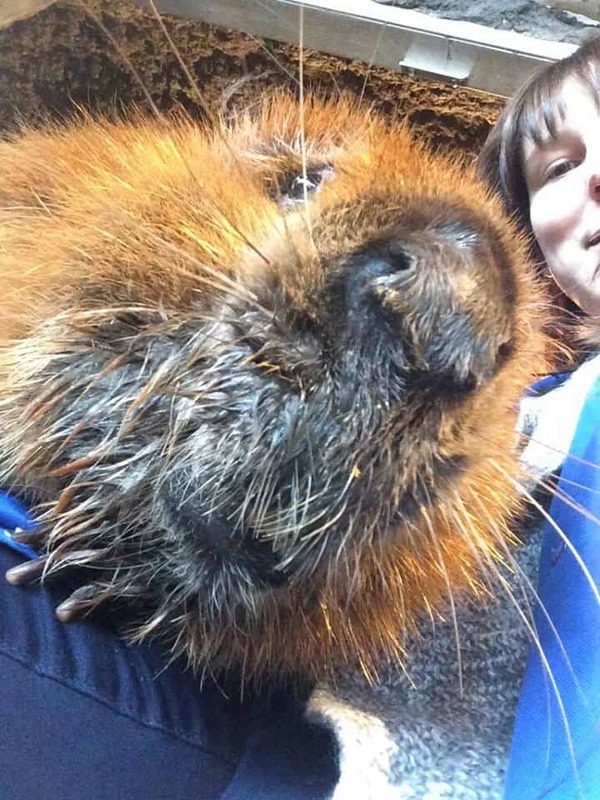 The animals ambassadors on this floor include the Beaver, the Common Snapping Turtle, the Northern Water Snakes and local fish found in Northern Ontario Lakes. This sections allow people to get a better understanding of the aquatics systems that surround Northern Ontario and the difficulties and challenges these systems are currently facing. 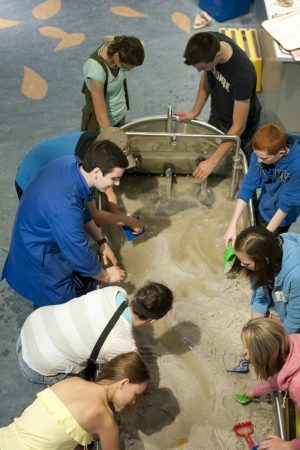 As well, the stream table (also known as the sand table) shows people what is erosion and how erosion can shape the landscape around us. Wetlands - The wetlands area teaches about the complex wetlands ecosystems. With Lilly creek situated right beside Science North, people are able to go on Lilly Creek tours (weather permitting) and get a personal look of what makes wetland such an important landmass for our ecosystems. Some of the animal ambassadors include Northern Ontario frogs (including Green Frogs, Wood Frogs, Tree Frogs and Bullfrogs), American Toads, The Eastern Massasauga Rattlesnake and the painted turtle. This section also houses the SO2 monitor, which measures the sulphur dioxide levels in Sudbury. There is also an interactive computer that displays the current reading of other sulphur dioxide monitors located throughout the Greater Sudbury region. Discovery Theatre - The discovery theatre is located in the centre of the third and fourth levels of Science North. Here, live science shows cover topics ranging from fire to sound. A daily schedule, located in front of the theatre and on the LCD screens around the Science Centre, is kept up to date and people can schedule their day around the shows they want to see. Usually, upbeat music will be played two minutes before the show starts to allow people to know the show is about to begin. Wheelchair accessibly is offered on the first, and third level of the discovery theater. The Northern Garden - The Northern Garden is located outside of the science centre. This gives people the opportunity to learn about native plant species in Northern Ontario, plant growth and general garden maintenance. BodyZone - BodyZone teachers about DNA and how it makes people unique, and how bodies work. There are also many exhibits allowing visitors to measure their performance, such as the race track. The Club Genome object theatre entrance is also in BodyZone. Racetrack - Build a race car and run it on the figure 8 track. This area also features a K'Nex table, a Lego play area, and the ball wall. FedNor CyberZone - The focus of CyberZone is on computer and communications technology. Visitors can mix music at the DJ station, play with green screen technology, and create stop-motion animation movies. Space Place - This lab focuses on astronomy and space exploration. Exhibits include a 6-foot (1.8 m) gravity well, a microgravity drop tower, exhibits on SNOLAB, and information on Canadian space exploration. The entrance to the "Between the Stars" object theatre is also found in Space Place. This show explores the topic of dark matter - why we know it exists, and how we are trying to detect it. Between the Stars opened in June 2010 and is designed to appeal to all age ranges with a cartoon character named String Man narrating the story of a topic that is quite complex. TechLab - Technology and engineering area where visitors can create circuits, take apart old electronics, and play with pulleys and gears. An agency of the provincial government of Ontario, Science North is overseen by the provincial Ministry of Tourism, Culture And Sport.